"Very quick and simple. 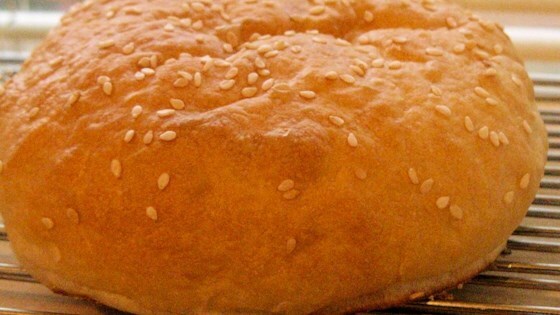 Nothing is better than fresh hamburger buns. This is a very sticky dough that requires very little kneading." Turn the dough out onto a lightly floured surface and divide into three equal pieces. Divide each big piece into 6 small ones. Form the pieces into rounds. Place the rounds into the prepared pan. Cover the rolls with a damp cloth or plastic wrap and let rise until doubled in volume, about 20 minutes. Watch how to make hot cross buns! You can add spices, fruit, or vegetables to this recipe. It makes great Onion Buns! i'm always looking for an easy recipe for "store-bought type " breads. OK!